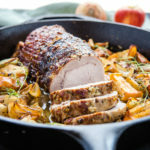 This Easy One Pan Maple Glazed Pork with Apples and Onions is a delicious and healthy holiday-inspired main dish made in one pan in less than an hour! Heat a large cast iron skillet over medium-high heat and add the olive oil. Pat the pork roast dry with a paper towel and generously season all sides with salt and pepper. Brown all sides of the pork roast in the hot cast iron pan until the outside of the roast is golden brown. Don't worry about cooking in all the way through here (it will finish cooking in the oven! ), just get that nice golden brown colour on the outside. Remove the pork roast from the pan to a plate and set aside. Add the onions, apples, thyme, rosemary and paprika to the pan and toss well in the meat juices. Let the onions and apples cook just until they begin to soften and take on colour. Prepare the glaze by whisking together the maple syrup, garlic, dijon mustard, thyme, rosemary and soy sauce in a small bowl. Add the pork roast back to the pan and nestle the roast into the bed of apples and onions. Brush the glaze over the pork roast to coat it generously on all sides. Use all the glaze, and if necessary pour the remainder over the roast. Place the skillet in your preheated oven (to 375 degrees Fahrenheit) and roast for about 35 minutes or until the center of the roast reaches an internal temperature of 65 degrees Celsius or 145 degrees Fahrenheit. Remove the skillet from the oven when the pork is cooked through and cover with foil, letting it stand for about 5 minutes before slicing and serving. This recipe is best served with roasted or mashed potatoes. Use an instant-read thermometer to ensure you don't over-cook the pork by cooking it only until the desired temperature is reached. Because pork roasts come in different thicknesses, it's best to rely on temperature rather than a specific amount of time in the oven (although expect anywhere between 25 and 40 minutes, to be safe). Garnish the dish with fresh sprigs of rosemary and/or thyme (if desired).